It’s not the 6000th year since creation according to the Jewish calendar. We still have over a century to go according to that. Just say’n. (coughs) Ah… Hail Dawkins! but of course the christians don’t use that book (supposedly) and think the world is only 5000 years old . . . Hail Dawkins! It’s not about years since creation, but since Jesus birth (something that’s “established” as 2015 years ago), and his supposed come back (“there are some standing here, which shall not taste death, till they see the Son of Man coming in his kingdom”). Hence Anno Domini, Common Era, why “western world” has year 2015 (can just hear those bubbles bursting), and why Islamic calendar is on year 1436 (yes, they don’t count it from J-man birth). There’s also the rather simple fact that the Jewish prophecy for the Messiah don’t have some sort of ‘come back’ clause to them. We’ll know the Messiah in part by what he’ll do with his life. 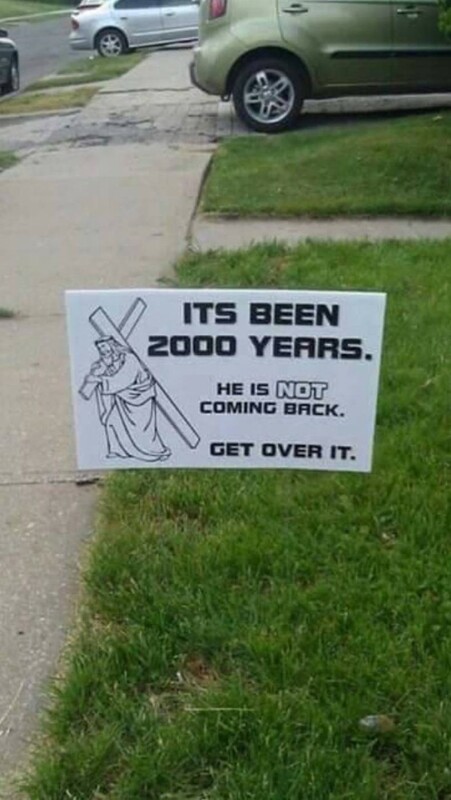 There isn’t a ‘leave and come back later to finish it’ portion to it making it hard for Jesus to be the Messiah since he didn’t do everything the Messiah was supposed to do.